The dangerous effects of climate change are becoming increasingly apparent. There could be a brief time this summer when there is no ice on the North Pole, a US scientist Mark Serreze stated in June 2008, blaming global warming that has melted the Arctic ice sheet over decades. "We could have no ice at the North Pole at the end of this summer" National Snow and Ice Data Centre scientist Mark Serreze said. He put the chances of there being no ice at one point at 50 per cent, saying it could see "ships sail from Alaska to the North Pole, that's possible". "Clearly if you look over what we have seen in the past three years and where we were headed, we are in ... this long-term decline and we may have no ice at all in the Arctic Ocean in summer by 2030 or so." 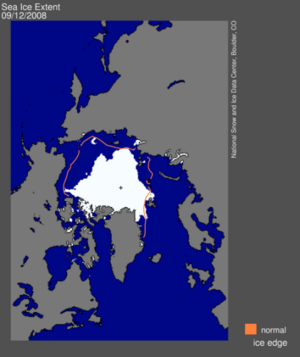 On September 2008, NASA issued a preliminary report confirming environmentalists' fears of disappearing sea ice at the Arctic. Sea ice is the thick permanent ice formed by frozen ocean water that remains even as seasonal ice melts away in the summer. In the past, it has covered about 60 percent of the Arctic. The sea ice at the Arctic has now been found to have melted away by as much as half, according to a preliminary report issued by NASA and the NASA-supported National Snow and Ice Data Center at the University of Colorado. "According to NASA-processed satellite microwave data, this perennial ice used to cover 50 to 60 percent of the Arctic, but this winter it covered less than 30 percent," according to NASA. It is the second-smallest amount of coverage since NASA began monitoring the situation in 1979. The Artic's sea ice coverage this September is about 33 percent below average, compared with the record low of 39 percent below average recorded in 2007." Scientists are warning that human-enhanced climate change is taking its toll on the world's plants, animals and physical environment much more quickly than previously thought. An international research team has found that many accounts of plants flowering early, birds changing their migration habits, and glaciers and mountain snow melting were most likely the result of rising greenhouses gases. Climate change from greenhouse gases is not only affecting the temperature," said David Karoly, a professor from the University of Melbourne's school of earth sciences and a member of the research team. "It is important for all people to get this message. The urgency of responding to climate change is critical." There is a historical correlation between C02 levels in the atmosphere and sea level rises. The current CO2 level of 380ppm could eventually equate to sea level rises of more than 2 meters. There is alarming evidence that increased levels of carbon dioxide in the atmosphere are harming ocean-based animal life. When CO2 enters the atmosphere it's absorbed by the ocean causing increased acidity in the water. A new study has found a link between this process and a decrease in the shell-making ability of microscopic marine organisms. Climate scientists have used computer models to predict increasing frequency of extreme weather events associated with climate change. These include more frequent and severe bushfires, floods, droughts, snowfalls and hurricanes across the globe. This page was last modified 00:47, 4 February 2011. This page has been accessed 38,574 times.